Pasta is a favourite in many homes, but sometimes it’s bewildering to know which pasta to use for which dish. Here’s how to work it out. Many people believe fresh pasta is in some way better than dried, but this isn’t necessarily the case. Most Italian kitchens will contain both and they are used for very different dishes. Dried pasta is denser when cooked and remains firmer to the taste – it’s the ideal pasta for chunky sauces or those containing meat or a lot of oily ingredients. Fresh pasta is softer and more absorbent – choose it for butter or cream based sauces or those with delicate flavours. Then there’s the range of shapes and sizes of pasta that are available for use in cooking. The basic guideline is that slender or delicately shaped pasta such as angel hair, vermicelli or thin spaghetti are designed to work best with thinner sauces or even in broths, while more solid pasta shapes, like fettuccine, spirali or farfalle are excellent with heavier sauces while pastas that contain holes or substantial ridges such as or radiatore (shaped like radiators!) are especially created to hold onto the ingredients of chunky sauces. It doesn’t matter whether your pasta is fresh or dried pasta – large amounts of boiling salted water are necessary. A rule of thumb is 6 litres of water to every 500 grams of pasta and the water needs to be on a rolling boil for the pasta not to stick to the bottom of the pan – putting olive oil in the pan does stop the pasta sticking but it also stops your sauce sticking to your pasta, which is less helpful! Instead of using oil, stir the pasta every couple of minutes (dried) or the whole time it’s cooking (fresh) to ensure it doesn’t stick. Pasta should be cooked in a pan with the lid off, and you can leave a large wooden spoon in the pan to stop the water boiling over. 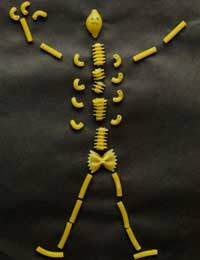 Pasta should be cooked ‘al dente’ which is Italian for ‘to the bite’ and you can test this by lifting a piece of dried pasta out of the pan about thirty seconds before the end of the cooking time – you should feel a little resistance in the pasta as you bite down. Drain cooked pasta without over shaking it as removing all the water can cause the gluten in the pasta to stick together, making it form a mass, then stir the pasta into the sauce. Fresh pasta may need as little as thirty seconds cooking time although three minutes is more usual, so you need to keep testing it for the al dente point. Dry pasta can be kept in a cool dry place such as a cupboard for up to twelve months – don’t let it sit in the sunshine and if it’s in a plastic bag, make sure that you seal it up again very well once you’ve opened it, as the slightest amount of moisture can spoil dry pasta very quickly. It can be difficult to mix packets of dry pasta as the gluten content may vary from batch to batch even if the pasta looks identical so try to use up an entire packet before you open another. Cooked pasta needs to be refrigerated and can be stored in the fridge in an airtight container for up to five days – cooked pasta does intensify the flavours of any sauce, so don’t store the sauce with the pasta – keep them separate, with a few drops of mild flavoured oil mixed into the pasta to stop it sticking – and then combine sauce and pasta only when you reheat or serve them.